Lyle: You're going to learn how to move these chord shapes up the neck. Gilmour, The Edge, to just name a few use the D position shape chords all the time. They sound good on the guitar. Lyle: This is tricky to do, and most of the time us guitar players don't like to make this chord shape, so we leave out the 4th string. BigTX: I can see why......its a stretch. Lyle: Like I said, sometimes you can leave out the 4th string and just hold down the first 3 strings, like a normal open D chord. 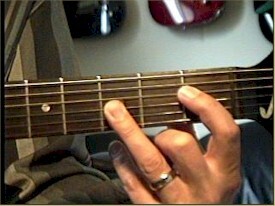 Lyle: In this example I played the open D chord, then moved the three finger shape up 1 fret at a time. smitty: So I guess you can play an C open and a Db before getting to the open D?? Lyle: Well, these plain major chords using this shape, they don't have any strings to bar. We're lucky for that, but the stretch is a bugger. 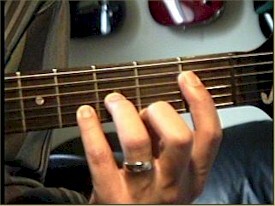 Chris: Kind of a nice jazzy chord. Lyle: You'll be moving your left hand all over the place! 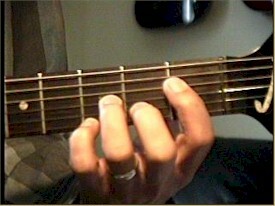 Lyle: Good finger exercise, but not a very practical way to play a minor chord, so again you can drop the 4th/D string. Joel: Does one need all 4 fingers for the minor chords.. just wondering.. seems painful at first. Lyle: Again, you can leave out the 4th string, the D string. Lyle: Just a couple more chord types to look at. 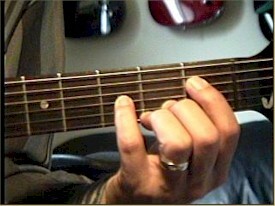 The minor 7 (m7, min7) chords are tough to play and another good finger exercise. I'm going to make you all great guitar players with these chord exercises! Lyle: What chord type have I left out? bluesguitarmp3: A piece of a song please..you have been ending with a song.. the past weeks? Lyle: Looks like we better take a break for now. Lyle: Think of this lesson as a great finger exercise. 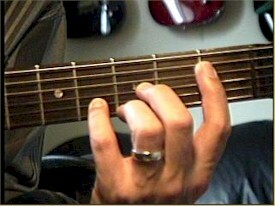 Practice playing the chord shapes up and down the neck, making each note ring clearly. Be able to play all 3 progressions right along with me using the looping jam tracks. That's your goal!